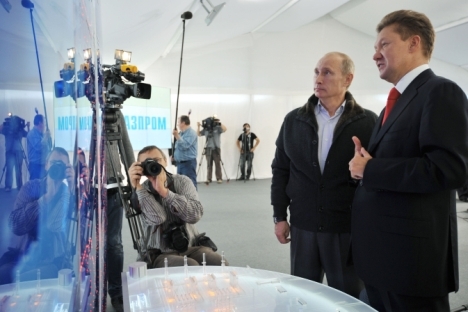 The Russian company is expected to sign a preliminary agreement on the project with Dutch firm Gasunie during President Putin’s visit to Amsterdam. Gazprom, Russia’s gas giant, intends to set up a new consortium to extend the Nord Stream gas pipeline to the Netherlands. President Vladimir Putin's visit to the Netherlands on Monday was set to see Dutch state-owned Gasunie sign a memorandum of agreement to join the construction of a third branch of the pipeline. Gasunie is a shareholder in the first two sections of Nord Stream, but Gazprom has yet to determine the terms of the next phase of the project. What Gazprom will get in return from Gasunie is not yet known, as it has yet to exercise its option to participate in a pipeline project to Britain under an existing partnership. During President Putin's visit to the Netherlands, due to begin Monday afternoon, Gazprom and Gasunie were to sign a series of agreements, said the Russian Ambassador to the Netherlands, Roman Kolodkin. A source close to Gazprom reported that the two companies were to sign a memorandum of understanding on Gasunie's involvement in a consortium to expand the Nord Stream gas pipeline, which runs from Russia to Germany under the Baltic Sea. Kommersant's source did not disclose the details of the memorandum, but stated that the document was being worked on. Gasunie declined to comment. Gasunie already has a 9 percent stake in Nord Stream AG (Gazprom owns 51 percent, while Germany’s Wintershall and E.ON own 15.5 percent each, and France’s GDF Suez owns 9 percent), which built the first two sections of the pipeline. The first section came on stream in November 2011, and the second in October 2012. The combined capacity is 55 billion cubic meters of gas a year, and the cost of construction was $7.4 billion. Gasunie joined the consortium in July 2008. In exchange for a stake in Nord Stream, the Dutch company granted Gazprom an option to acquire 9 percent in the Balgzand-Bacton Line (BBL) pipeline, due to run under the English Channel from the Netherlands to Britain with a capacity of 20 billion cubic meters per year. But the option was not exercised. Gazprom has not commented on the reasons why, although it has repeatedly voiced its desire to increase its activity on the UK market. In January, Gazprom CEO Alexei Miller stated that a new consortium would be put in place to construct the third and fourth sections of the Nord Stream pipeline. The route could even be divided into sections, each overseen by a different group of shareholders. Late last year, Gazprom began negotiations with British energy major BP on the extension of the fourth section of the pipeline to Britain, but the outcome of these talks is not yet known. Gazprom's original intention was to determine the configuration of the pipeline extension by late January, but the decision was put back until the end of the first quarter and has still not been taken. In mid-March, Mario Meren, a member of the board of directors at Wintershall, announced that the company was "examining a feasibility study, after which a decision would be taken on the project" and the company's participation in it. BP has made clear that it "maintains an interest in the project, but a final decision on participation is pending." The sharp rise in gas spot prices as a result of a shortage of LNG during the cold snap in March across Europe, especially in the UK, means that the atmosphere for talks on expanding Nord Stream is favorable, said Valery Nesterov, an oil and gas analyst at Sberbank Investment Research. Gazprom wants to increase supplies to Britain from the current annual level of 8 billion cubic meters (mainly under spot contracts) to 40 billion cubic meters (equivalent to 50 percent of the UK market), said Vitaly Kryukov of IFD Kapital. He said that Gazprom could keep its option to acquire 9 percent of the Netherlands-Britain interconnector (Gasunie currently owns 60 percent, while E.ON and Belgium’s Fluxys each have 20 percent), in which case Gazprom would be able to exercise it in one form or another on Gasunie's entry to the new consortium. Gazprom may also be interested in other gas transmission assets in Europe. State-owned Gasunie controls a network of gas pipelines stretching 15,500 kilometers, with a capacity of up to 100 billion cubic meters per year. It also possesses two LNG terminals and underground gas storage facilities. Gasunie's gas transmission system is connected to Nord Stream via the NEL gas pipeline through Germany (with an annual projected capacity of 20 billion cubic meters), and is also a major supplier to other EU countries.